The first time I read this book, I thought it was a real stinker. I was teaching high school and plowing my way through about a billion memoirs in order to put together a list of suggested titles for my Honors classes' outside reading assignment. (Eventually, I relaxed enough as an educator that I didn't feel compelled to personally preview every single book that ended up on one of my outside reading lists. This story takes place during my first year of teaching, when I still Really Cared A Lot and didn't have anything better to do, like a husband.) Mary Karr's memoir was highly touted, with some claiming it was at least partly responsible for the renaissance of the genre in the 90s. It seemed like a good option for my students—what teenager doesn't love reading about dysfunctional childhoods? The actual reading of it, though, was a strange experience. Karr relates scenes from her life exactly as she remembers them—which means rife with memory holes and time jumps and introspection. She hasn't glossed anything up or filled in what's missing. She just presents her fractured memories, occasionally in some semblance of chronological order, but more often loosely connected by the feelings the memories evoke. Her execution resembles a patchwork, with discordant colors and patterns butting up against each other seemingly at random, but when you back up and view the memoir as a whole, you can see there was in fact an overarching pattern at work. It's this zoomed-out view that I wasn't able to achieve the first time around, as a harried, no-nonsense teacher. Now, I've slowed my life down sufficiently that I'm able to appreciate what Karr was creating. Sometimes, you have to give books a second chance. I include that tidbit for myself more than anyone else, as I wouldn't have ever considered reading this book again if it hadn't been for the intervention of my local library. In December, they held what was quite possibly the cutest promotion ever: librarians chose some of their favorite books from the shelves, wrapped them in festive paper, and adorned them with brief plot synopses. Patrons could then pick a book that sounded interesting, and the title would be a surprise upon unwrapping the book at home. I have to admit I was disappointed when I realized the book I'd unwittingly chosen was one I'd already read and disliked, but I decided it was important to trust the librarians. They know what they're talking about. I've found the older I get, the easier it is for me to enjoy a wide range of books. I think the secret has less to do with age and more to do with an openmindedness that I have painstakingly cultivated over time. Rather than wishing a book were more to my taste (in this case, more sequential, ordered, and plainspoken), I try to figure out what the author was trying to do in making particular artistic choices. 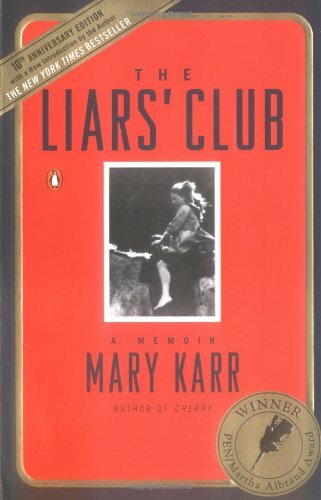 Mary Karr is a poet, and this is the kind of memoir a poet would write. Reading her work with that understanding in mind prevents me from reading too much in my own image. After all, it's a book about her life, not mine. Bottom line: Read this book, and let it be what it wants to be.